I received the OWB Recon from Formidable Force Holsters almost two weeks ago, and the first thing I noticed about the rig was the 80-20 split, as opposed to a 50-50 or 60-40 split used in most kydex pancake holsters. With a trailing pancake loop and a standard belt loop in front, the holster reminds me of some leather rigs with a trailing loop. It seems to pull the grip into the body, and so far I like how it feels when worn. What I like most about the holster right now is the satisfying click when the pistol is holstered. It’s one of the best clicks out of any holster I’ve used. The Recon has adjustable retention, so you can tailor it to your personal preference, and the click lets you know that your blaster isn’t going anywhere. The holster rides very high, with adjustable cant, and it works well to conceal Wilma, my Gen4 G19. Finishing on the rig is well done, with smooth and polished edges and a flared opening for easy reholstering. The muzzle of the holster is molded for threaded barrels, and the sight channel will accommodate tall sights without a problem. I’m going to run the holster off-duty for the next month or so and have a full review to share. 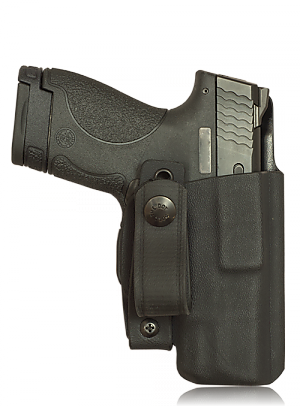 At $75, the holster is on par with other custom thermoforgers, and an OWB rig is perfect for the cold months ahead. While waiting for my full review, check out the deals on Formidable Force’s site–their EDC IWB rig is only $30 and ready to ship. That’s as cheap as a mass-produced injection molded rig but from a custom shop! Check out Formidable Force on Instagram and Facebook for more info.